The control and management of Electronic Systems gauges are done by the Sintel operator console. Universal configuration for all Electronic Systems control and measurement gauges. Operator interface developed with Windows® operating system. Reduced dimensions and high versatility. Designed for the continuous operating in industrial application. 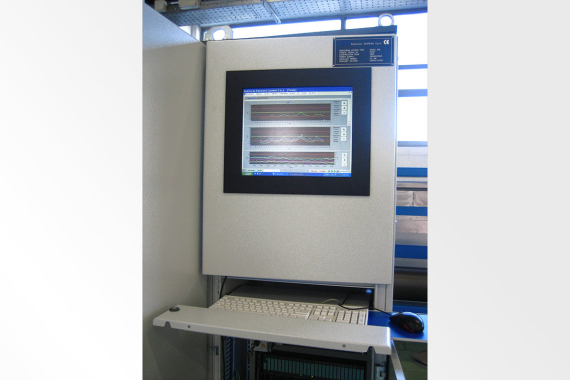 SINTEL™ WIX operator console is composed of a metal panel containing system electronics for the measurement gauge. Inside the cabinet, the hardware and software control and manage the machine processing cycle during the production. It is also structured using two personal computers working together: a PC with Windows® operating system, used as graphic interface (HMI), and an industrial PC with embedded “real-time” operating system, used as system control processor (EC). Interconnections to measurement and control instruments and to plant devices are performed by decentralized peripheral units connected through the network. This solution allows a very high flexibility on system integration and installation, reducing overall dimensions and plant costs, so to generally simplify the whole installation.